Outlook and Outlook Express Password Recovery Software easily allow you to recover all lost or forgotten Microsoft Outlook and Office Outlook configured mail account passwords in the easiest way. The password rescue utility easily works with all major versions of Office Outlook and Outlook Express mail server. Similarly restore all identity passwords of your Office outlook mail servers. Our password recovery software easily answers all your questions including How to recover lost mail account passwords. The password recovery software is very easy to use and help to access and manage your multiple Live Mail accounts, including email messages on the Microsoft popular mail server. 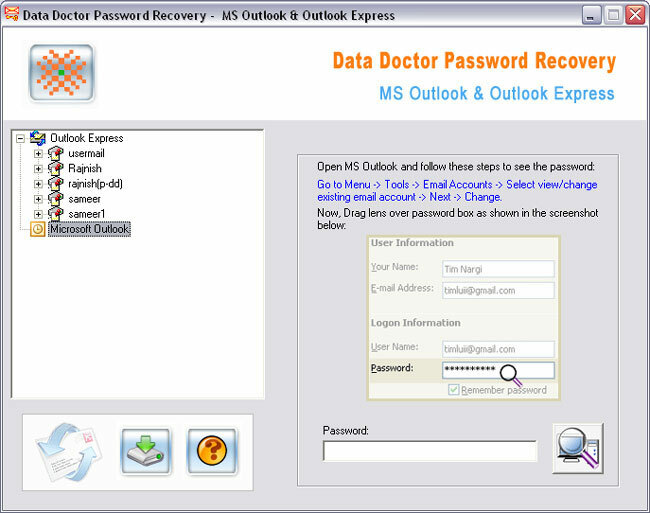 Download and run the FREE demo version of the Outlook and outlook express password recovery software. The demo software will show you the first two characters of the recovered password. Complete password is available on the Full version.